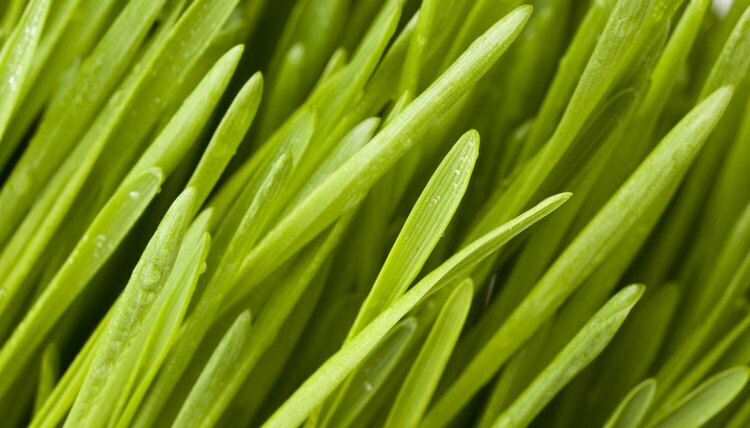 Wheatgrass is just that: grass from a wheat plant that's harvested before it develops gluten. Its primary benefit for your dog's digestion is the bit of extra fiber it provides to help things keep moving along, though it also aids in good bowel health. It may not be a miracle food, however your dog likely will appreciate a bit of it sprinkled on his dinner once in a while. Wheatgrass can be juiced, dehydrated into pills or tablets or, if you're a dog or a cat, ingested in its natural, grassy form. If your dog enjoys nibbling on this fresh grass, its high fiber content probably will help keep him regular. As well, it's rich in magnesium, which supports your dog's bowel health. His digestive system isn't the only part of him that will appreciate the wheatgrass; it's also a good source of antioxidant vitamins C and E, as well as chlorophyll, to promote healthy muscle tissue and blood. There is too much of a good thing, however, and if your pup shows an affection for wheatgrass, don't let him eat too much at once, lest he return it to you on the carpet. If you have a small pot of wheatgrass, trim about an inch off the top, chop it up and sprinkle on your pup's dinner a few times a week. WebMD: Is Wheatgrass Good for You?